Not only did I decorate my Christmas tree, but I organized all my Christmas ornaments and the boxes they are stored in, so that when I have to put it all away, it will be much easier. I finally got out every box of Christmas type "stuff" I have and went through it all, discarding anything broken or that I really didn't like. There wasn't too much to discard, but it felt good to know what I have. In past Christmas seasons, I would just get out the one or two boxes I knew the ornaments were in - and all the rest of the accumulated decorations I would just ignore. Not this year - I pared down a bit, organized, and put lots of pretty and fun things out that I ordinarily was too tired or harried to bother with. 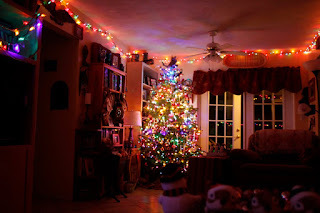 Here are some pictures of the various corners of our living room, which is where all the decorations and the tree are. First, the Christmas tree in the corner. It is blocking a bookcase, but it is the only place to put it. In the front, you can make out three funny squirrel faces - that is one of those "press the button" singing and dancing decorations. It is of three squirrels and they are very cute as they sing and wave their arms. Next, the area over my husband's chair. There is a shelf on the left where the manger scene is and I just put lights wrapped with fake pine greenery all around that shelf and the one to the right. I know you can't see any detail, but the lights are pretty, right? The lights around the ceiling are up all year round. 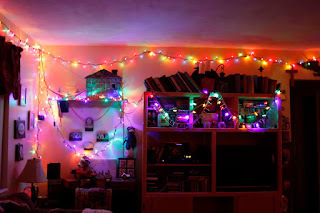 I can't bear to be without colored lights - so the ceiling ones are permanent. Under that is the bookcase/entertainment center. 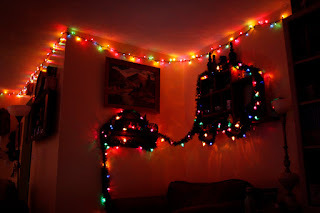 I pretty much put lights on just about everything - and I displayed every Christmas basket, mechanical toy - you name it. I'm ready for Christmas, folks!! Now all I have to do is purchase a few small gifts. iz bootiful LOL wish I was there! Thanks!! My motto was "You want Christmas??? You're gonna get Christmas." hee hee.